All forms of advertising (vehicular & non-vehicular) are prohibited when operating at the airport including in the vehicle staging lot and pickup/drop-off areas. At California airports other than those listed above, operations are currently prohibited — including pickups and drop-offs. This includes (but is not limited to) all airports in the list below. For more information on prohibited airports in California, please click here. Offer to take them to a nearby destination. Note: drop-offs at rental car agencies and flight schools are currently prohibited at this time. As a driver on the Lyft platform, it's important that you know and follow airport regulations. While we've worked hard to reach agreements with many California airports, there are other California airports where we do not currently have permission to operate. BUR Rideshare Regulations Video: Click here to watch a video on detailed operating procedures at BUR airport. Pick up passengers from the first island of the pedestrian curb outside of Terminal B. To get to the pickup area, stay in the left lane and follow the signs for Valet. After you pass the Short Term Parking Structure, follow the Commercial Vehicles Only Sign and move into the right lane. Pickup at the south end of the island, across from Terminal B baggage claim. Please pull all the way to the end and do not double park. Do not pick up passengers anywhere besides the designated pickup area above. Do not park and loiter at the pickup area at any time. Drop off passengers curbside at their terminal of choice. Wait in the designated staging area. Only drivers within the designated staging area (along Siempre Viva Rd) are added to the queue. Pick up passengers at the terminal curbside. Pick up passengers from the designated Rideshare area (look for the signs), between the main lobby and baggage claim. Do not wait or circle back at the airport if the passenger is delayed. FAT requires you to leave the airport and kindly ask your passenger to request another ride when he or she is ready. Do not wait at the airport for additional ride requests after drop-off. Wait in the designated staging area. Only drivers within the designated staging area (TNC Holding Lot, pictured above) are added to the queue. Pick up passengers from the outer curb at Arrivals. Do not wait at the airport or circle the terminal if the passenger is delayed. Instead, use the staging area. Do not wait at the airport after drop-off. If you would like to accept additional requests, head to the staging area. Heads up: Due to Los Angeles World Airports (LAWA) regulations, Lyft is currently unable to allow TCP vehicles to pick up passengers at LAX. Learn more here. Visit LAX's Traffic Site here for real-time updates regarding on-going construction projects and road closures. You must have a permanent license plate in order to operate at LAX airport. You are subject to airport citations if you drive at the airport with temporary plates. Beginning 10/18/2018, there will be a new, Lyft-only staging lot opening in the block bordered by Vicksburg Ave, W 98th St, S Sepulveda Blvd, & 96th St. The entrance to the new lot is located at the south east corner of the lot, along W 98th St. The new lot is open from 6am-10pm, daily. There will also be a Lyft service trailer inside the lot open from 8am-8pm, daily. The old staging lot will still be open for use. It is located on the western boundary inside the TNC Assignment area. It can be entered from from 6100 Westchester Pkwy. Wait in the designated TNC assignment area. Only drivers within the designated area are added to the queue. You may use either staging lot or wait in another location within the TNC assignment area (pictured above). Do not wait in the Burger King parking lot. It is not part of the TNC assignment area. The queue is first in, first out. The driver who has been waiting within the assignment area in driver mode the longest gets the next request. Your physical location within the assignment area doesn't affect your spot in the queue, but if you exit the assignment area or log out of driver mode, you'll lose your spot. A limited number of drivers are allowed in the queue at a time. Follow the instructions in the app. If directed to leave, you must exit the assignment area. Learn how to view your position in the queue here. If the staging lot is full, you must leave the lot. You may wait for requests in a different location within the assignment area. You won't lose your place in line. Driver cancellations and missed requests affect your place in line. If you're the one to cancel a request or if you miss a request, you''ll be placed at the back of the queue. Do not use the limo parking spaces in the staging lot. Do not solicit local businesses in the TNC assignment area or violate parking laws. Only pick up passengers from the round Ride Service signs at Departures (Upper Level). From 4/21/19 - 5/6/19, pickup Spot E will be closed nightly (10:30pm-7am). Passengers will not be able to select Spot E as a pickup location and will be diverted to Spot F instead. Do not pick up passengers from Arrivals (Lower Level) unless is it for a designated ADA (disabled) passenger. If you're picking up an ADA passenger, you must use the ADA access loading zone. Do not wait or circle back at the airport or wait on the terminal roadway if the passenger is delayed. Instead, head back to the TNC assignment area (map above) and wait there for another request. Kindly ask your delayed passenger to request another ride when he or she is ready. Rematch is a feature that enables you to be matched with additional passengers shortly before or after completing a drop off. This means you can receive a ride request for up to 45 seconds after dropping off a passenger without returning to the assignment area. Please don't recirculate or wait in the Central Terminal Area for a rematch, as airport authorities may issue citations. Please review the LAX airport regulations above. Short ride bump: If you receive a request for a short ride from the airport after waiting in the queue, you may qualify for a higher queue position after you drop off your passenger. You’ll get an SMS after dropping off the passenger to let you know you can return to the assignment area for a preferred spot in the queue. Please note: if you give a ride before returning to the assignment area, you may still qualify for a preferred spot in line. All forms of advertising (vehicular & non-vehicular) are prohibited when operating at LAX Airport including in the vehicle staging lot and pickup/drop-off areas. You must have a permanent license plate in order to operate at LAX airport. You are subject to airport citations if you drive at the airport with temporary plates. If you need to politely decline the trip, here are some suggestions. Drop off passengers at Departures for the passenger's carrier of choice. Do not wait for requests at the airport terminal after dropping off a passenger. To accept additional ride requests, proceed to the TNC assignment area. 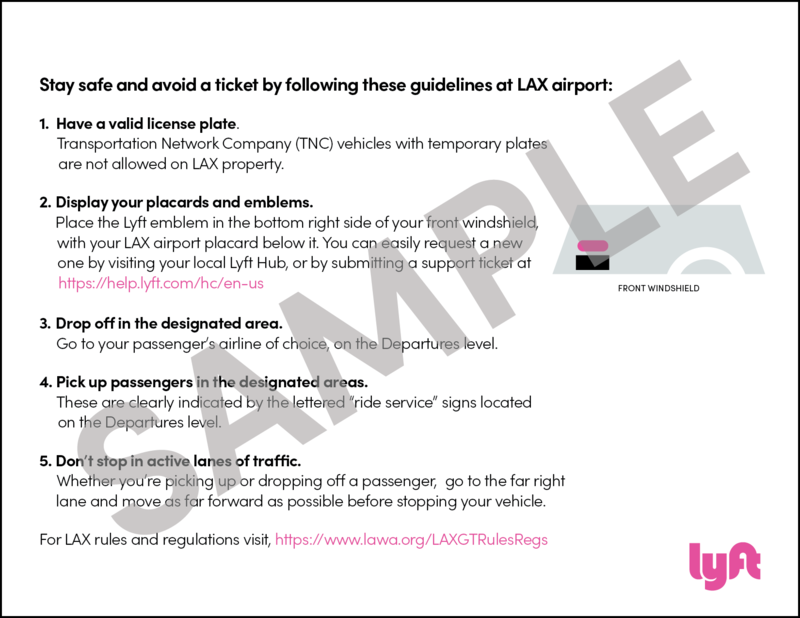 LAX prohibits Lyft operations from vehicles without permanent license plates. You must have a valid license plate displayed on your vehicle, as well as updated in the driver app in order to enter the airport queue or operate at LAX. Learn how to update your license plate here. You must complete the mandatory LAX lesson in order to conduct airport rides at LAX. See the lesson in the 'Tutorials' tab of the Driver Dashboard. You must have a permanent license plate to complete the tutorial. To receive your LAX placard, complete the LAX online lesson and quiz. You can access the quiz in the 'Tutorials' tab of the Driver Dashboard. Please note: you must both complete the LAX quiz and have a valid license plate in order to receive an LAX placard. To update your license plate, go to your Dashboard in the driver app, tap the menu icon in the top left, and tap 'Vehicles'. You can see approve vehicles and update your license plate if needed. You must only display the authorized placard issued to you directly by Lyft, which includes your assigned driver ID and other required fields. Drivers can be cited for displaying an unauthorized placard. If you didn't receive a placard, need a new placard, or need to update your license plate, let us know and we’ll look into it. Make sure to tell us which vehicle you need a placard or license plate update for. Your airport placard and Lyft emblems are sent to the shipping address on file. To change your address in the app, tap the left menu icon and go to Settings, then Shipping Address. If you drive more than one vehicle on the Lyft platform, each vehicle needs its own placard. LAX Airport prohibits the display of multiple TNC emblems simultaneously. While driving for Lyft, please be sure that you are displaying only your Lyft emblem. Drivers in the Los Angeles area are welcome to come to the Lyft Hub or Hub Lite in Wally Park for in-person support, replacement Lyft emblems, or to get a replacement airport placard. Educate yourself on how to assist members of the community with disabilities by reviewing our anti-discrimination policies. Review and comply with driver requirements in California. You may not pass out promotional cards at the terminal or airport. If you have complaints or comments to report to LAX, visit the LAX airport website to file them. 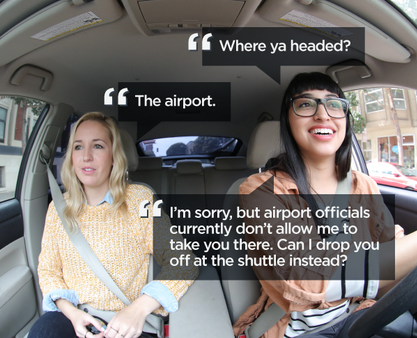 Drivers on the Lyft platform are responsible for knowing and following all airport regulations. Please see a full list of LAX’s rules and regulations, and the LAX ground transportation rules and regulations. As a driver, you must follow the rules listed below in order to avoid receiving administrative citations from LAX Airport. Pick up passengers from the commercial curb (3rd island) across the terminal entrance, and call your passenger to let them know where you are waiting. Do not pick up passengers curbside at the terminal entrance. Do not wait or circle back at the airport if the passenger is delayed. OAK requires you to leave the airport and kindly ask your passenger to request another ride when he or she is ready. Do not wait for airport requests at Airport Plaza (175-195 98m Avenue). Drop off curbside at the terminal entrance, at your passenger’s carrier of choice. At SFO and OAK airports, you are required to have an airport placard in addition to your two Lyft emblems. Note: Starting March 31, 2019, all drivers operating at SFO Airport will need to display a yellow SFO Airport placard. SFO Airport placards can only be associated with a valid vehicle license plate. 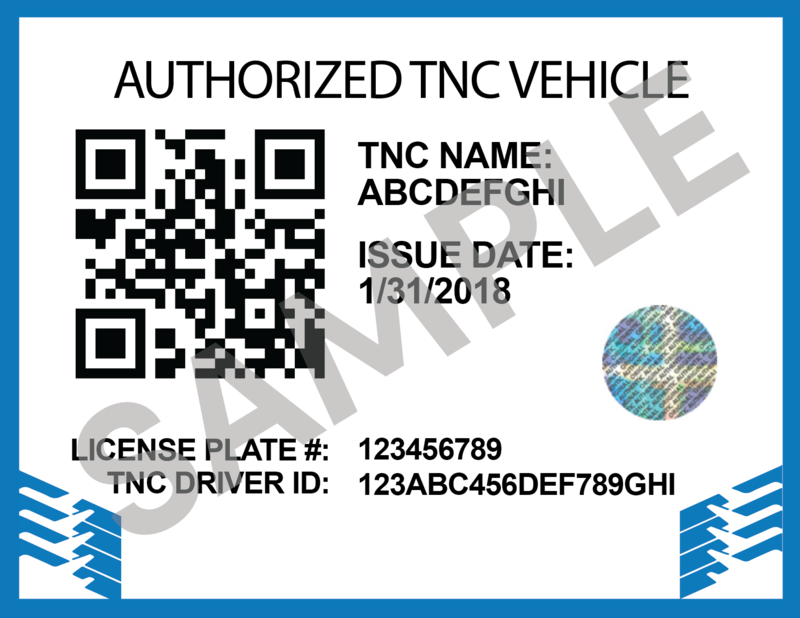 Vehicles must have their permanent license plate or a valid temporary license plate that contains their unique vehicle identification while waiting for the permanent license plate to arrive. SFO Airport placards will now expire when the associated vehicle's inspection expires. Drivers are required to have a vehicle inspection before becoming approved to drive, and at least annually thereafter. Vehicle inspections expire annually or every 50,000 miles, whichever comes first. This would be when the associated SFO Airport placard expires. If you're in San Francisco, Sacramento, San Jose, or the surrounding areas, visit one of these hub locations for a free annual re-inspection. To update your license plate: In your Lyft app, go to Dashboard, tap the menu icon in the top left, and select Vehicles & Docs. You can see your vehicle(s) and update your license plate if necessary. Once you've updated your license plate, or if you need a placard for an additional vehicle, reach out to our Support team. Drivers in Oakland and San Francisco are welcome to come to the Lyft Hub for in-person support or to get a replacement airport placard. Pick up passengers at the designated pickup zones outside each terminal (pictured above). Do not wait at the airport or circle the terminal if the passenger is delayed. ONT requires you to leave the airport and kindly ask your passenger to request another ride when he or she is ready. Do not wait at the airport or accept additional ride requests after drop-off. If you would like to accept additional requests, head to the staging area. Wait in the designated staging area. Only drivers within the designated staging area are added to the queue. Do not park on DuPont between Michelson and Business Center Drive or any other area marked "No Parking." Pick up passengers from the designated pickups areas as illustrated above on level 3 of Garages A, B & C. (Level 3 is the same level as the departures level). Do not wait or circle back at the airport if the passenger is delayed. SNA requires you to leave the airport and kindly ask your passenger to request another ride when he or she is ready. Wait in the designated staging area. Only drivers within the designated staging area (off of Kirk Douglas Way) are added to the queue. Once you have been matched with a passenger, exit the staging area by turning left onto Kirk Douglas Way. Continue driving past the public parking lot entrance about 120 feet then turn left at the sign labeled “TNC”. Once at the key pad, enter code 2580 (if you encounter code issues, press button for assistance, hold button down only when you talk). Continue through the gate to the TNC designated parking spaces located 500 feet past the entry on right side of roadway. Pull forward into the farthest open stall. Drive slow in this commercial lane yielding to pedestrian crossing and other loading vehicles. If your customer indicates they are on the building curb, do not pick them up, but instruct them to the designated pickup area in the outer roadway. Theairport strictly prohibits picking up passengers outside of the designated area. Doing so can result in you being removed from airport pickup privileges. Do not wait or circle back at the airport if the passenger is delayed. PSP requires you to leave the airport and kindly ask your passenger to request another ride when he or she is ready. Wait in the designated staging area. Only drivers within the staging area (pictured above) are added to the queue. Terminal A Pickups: Pick up passengers at the north end curbs. From the staging lot, drive north along Lindbergh Dr to get to the pickup area. Terminal B Pickups: Beginning Friday, 11/30/2018, pick up passengers along the northwest portion of Lindbergh Dr as pictured above. From the staging log, drive north along Lindbergh Dr to get to the pickup area. Rental Car Terminal: Stay close to the outer curb, as the inner curb is a bus lane. Do not wait or circle back at the airport if the passenger is delayed. Instead, head to the designated staging area or ask the passenger to cancel and request another ride when they are ready. Do not wait at the airport after drop-off. If you would like to wait for additional requests, head to the designated staging area. Wait in the designated staging area. Only drivers within the designated staging area are added to the queue. The staging area is located in the parking lot on the east side of Liberator Way. Terminal 1: Second lane from the terminal, between first and second crosswalks. Terminal 2: Lower level on the outer-most lane between second and third crosswalks. Do not wait at the airport or circle the terminal if the passenger is delayed. SAN requires you to leave the airport and kindly ask your passenger to request another ride when he or she is ready. You may get a pickup request right before or after dropping off at the airport (rematch ride). If you do not receive a rematch, do not wait at the airport. If you would like to accept additional requests, head to the staging area. Use designated staging area to wait for customer confirmation. Have the appropriate trade dress(s) affixed to the front and back windshield visible from 50 ft.
Obey all road instructional and warning signs. Enter the designated pick up zones cautiously in a single file line. When possible, roll down window when in pick up zones as to hear Airport Traffic Officer and Customer Representative (ATO/CSR) instructions. Listen for and follow Instructions of ATO/CSR. Pull all the way forward when in pickup zones. Exit pick up zones with caution, watching for pedestrians and other transportation modes. Logged into your driver app, actively waiting for rides at all times. Drive into the Terminal Transportation Islands aggressively. Ignore speed limit, stop, yield, crosswalk and other instruction signs. Enter designated zones with loud music or media playing. Have trade dress blocked or obstructed from view of ATO/CSR's. Double park to load or obstruct free use lanes. Pick up customers outside of the designated zones. Wait outside of the designated zones. Drive with an advertisement on your vehicle. Violations are subject to a $500 fine. Log out of your driver app and loiter. Violations are subject to citations. For a full explanation of SFO's rules and regulation, please visit SFO airport's Rules and Regulations page here. Wait in the designated staging area. Only drivers within the staging area are added to the queue. The entrance to the main staging areas is off of S McDonnell Rd. TCP (charter-party carrier) Vehicles/limousines should stage in the TCP staging area pictured above. Non-TCP vehicles should stage only in the TNC staging areas depicted above. Staging in the wrong area(s) are subject to airport fines. Beginning June 25, 2018:During high-volume times in the morning and evening, you may be dispatched to the upper level of the domestic parking garage for pickup requests from Terminals 1, 2, and 3. Please see map below and video here for details. International Terminal: Departures level, at the designated pickup locations along the outer curb (Zones 14-17). Do not pick up passengers from Arrivals (Lower Level). Do not stop in red zones. Wait in the staging area (pictured above) if your passenger is delayed — do not wait on the terminal roadway. If the staging area is full, you will need to leave airport property. Always obey the posted speed limit and keep an eye out for pedestrians. Rematch is a feature that enables you to be matched with additional passenger(s) shortly before or after completing a drop off. This means you can receive a ride request for up to 45 seconds after dropping off a passenger without returning to the staging lot. All forms of advertising (vehicular & non-vehicular) are prohibited when operating at SFO Airport including in the vehicle staging lot and pickup/drop-off areas. International Terminal: Departures level, at the designated drop-off location along the outer curb (Zones 14). As of July 23, 2018: Drivers will be permitted to drop off passengers on the arrivals (lower) level at both the domestic and international terminals in an effort to alleviate traffic congestion on the upper-level. Pick-ups at the arrivals level are still prohibited. Drivers in San Francisco are welcome to come to the Lyft Hub for in-person support or to get a replacement airport placard. Requests are given on a First-in, First-out (FIFO) basis at SJC. The staging area is located between the Bayshore (101) and Guadalupe (87) freeways. Wait in the designated staging area. Only drivers within the designated staging area (pictured above) are added to the queue. Do not wait in commercial parking lots for airport requests, including Filice Accountancy Corporation on Technology Dr. There is a 30 minute time limit in the staging area. If you do not receive a request within 30 minutes, you must exit the staging area and re-enter. Terminal A: pick up passengers from the east side of the Ground Transportation Island, at the Smartphone App Rides area — Spot 1. Terminal B: pick up passengers from the east side of the Ground Transportation Island south of center crosswalk, at the Smartphone App Rides area — Spots 8 & 9. Do not pick up passengers curbside at the terminal entrance unless is it for a designated ADA (disabled) passenger. If you're picking up an ADA passenger, you must use the ADA access loading zone. ADA passengers will call drivers to confirm their location at the ADA access loading zone. Do not wait or circle back at the airport if the passenger is delayed. SJC requires you to leave the airport and kindly ask your passenger to request another ride when he or she is ready. Do not cut through the Airport rental car facility when going from Terminal A to Terminal B. Doing so may result in a citation. Drop off passengers only at Departures at the passenger’s carrier of choice. Complete a business tax application. Follow the instructions and submit your application and check by mail or in person. Once you receive it, keep your business tax certificate in your glove compartment. You may need to present it to an officer if approached. Pick up passengers from Arrivals and pull up to the white curb. Do not wait or circle back at the airport if the passenger is delayed. SBA requires you to leave the airport and kindly ask your passenger to request another ride when he or she is ready. If the staging area is full, you must leave. You may not wait for requests anywhere else on airport property or use any other parking lots while in driver mode. Pick up passengers in the designated areas around the airport as pictured above. Do not wait or circle back at the airport if the passenger is delayed. Drop off passengers in the designated areas around the airport as pictured above. First, be sure to review and understand the TNC Driver Rules of Conduct for STS Airport. Pick up passengers from one of the four designated TNC spaces (pictured above). Do not wait or circle back at the airport if the passenger is delayed. STS requires you to leave the airport and kindly ask your passenger to request another ride when he or she is ready. Drop off passengers at the main terminal in the designated Loading Zone. Pick up passengers curbside along the inner loop (pictured above). Drop off passengers curbside along the inner loop (pictured above).